More than invasive 15,000 Pterois spp. 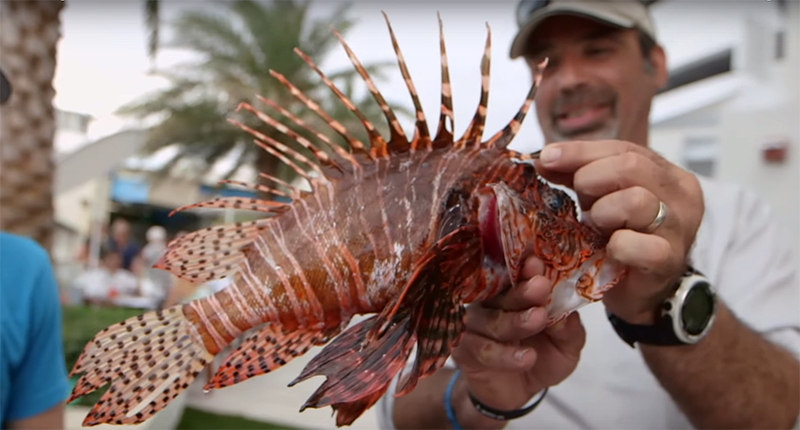 lionfish were removed from Florida waters thanks to several spring tournaments held across the state focused on targeting the highly predatory species that is considered a serious threat to native fishes in Florida, the Gulf of Mexico, and the Caribbean. At a current retail price of about $40 for a live Volitans Lionfish in the aquarium trade, the value of fish speared and eaten totals an estimated $600,000. Aquarists releasing unwanted pet fish are often blamed for the lionfish invasion, although scientists continue to debate the origin of this plague. Five of the fish taken in the most-recent hunt had been tagged previously by Florida Fish and Wildlife Conservation Commission (FWC) staff as part of the 2018 Lionfish Challenge, a removal incentive program that started May 19 on Lionfish Removal and Awareness Day. 9,606 – Lionfish World Championship – Pensacola. 4,056 – Lionfish World Championship Pre-Tournament – Pensacola. 1,490 – Lion Tamer Tournament – Panama City Beach. 231 – Florida Skin Divers Association Lionfish Calcutta – St. Petersburg. Postponed – Sebastian Lionfish Tournament – Sebastian. 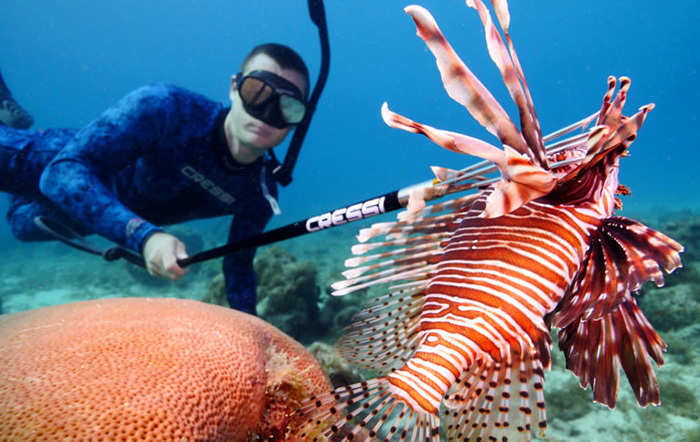 Florida’s lionfish posse has both mounting success and a growing range of team gear. The Lionfish Challenge runs through Sept. 3. More than 200 people have already registered to participate in the statewide Challenge, which rewards lionfish harvesters with prizes for their lionfish removals, tagged or not. The tagged lionfish component is new this year and includes cash prizes up to $5,000. Lionfish were tagged at 50 public artificial reefs across the state. Harvesters who caught the five tagged fish this weekend took home cash prizes up to $2,500 and non-cash prizes as well. All five tagged fish were caught off Escambia County. Sign up and learn more today by visiting MyFWC.com/Lionfish. The FWC thanks all of the sponsors and organizations across the state that helped make this Lionfish Removal and Awareness Day event a success. Remember, lionfish and other exotic pets that can no longer be cared for should never be released into Florida waters or lands. To learn more about where to surrender an exotic pet for adoption, visit MyFWC.com/WildlifeHabitats and click on “Nonnative Species” and “Exotic Pet Amnesty Program. 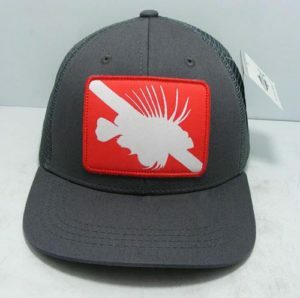 Support Florida lionfish control programs by purchasing new Rep Your Water lionfish hats at Fish & Wildlife Foundation of Florida. This is disgusting. A wild killing spree of lion fish. This is their answer? Anyone who has kept a lion fish in their aquarium is probably as disgusted as I am. Where are those great savers of the reef who got Yellow Tang collecting banned in Hawaii? I guess there were no cameras around for them to be seen on. We aquarium keepers are the real conservationists. We take care of aquatic animals in a predator free environment where their food is dropped in every day. I live in Florida, and I would not even consider jumping in the water to see how many beautiful lion fish I could run through with a spear. What is reeftorainforest.com doing with this feel good article on lion fish massacres. I hope the lion fish got to sting a few of their killers. Surely rather than killing these fish some could be put back in to the aquarium trade maybe even shipped back to where they belong. I know that they are invasive and are not indigenous to the Florida waters but a mass killing spree (15000) that cannot be seen as a result. In reply to DM and Paul Lobster and with no disrespect, you obviously have not fully understood the magnitude of the problem and it is not only in Florida, where the invasive Lionfish is literally, wiping out entire fish populations. How about you research the issue, before you respond in a purely emotional way. Secondly, what is YOUR solution to the decimation of all of the OTHER fish throughout the Caribbean waters? The Lionfish have no natural predators in these waters! I support lionfish removal from Florida and Gulf waters. They are invasive species, wiping out native fish. Rehoming 15,000 lionfish is not a practical or feasible solution. Rehoming all the invaders is impossible. Turning lionfish into a reasonably priced food fish could feed many many people who can’t afford fish in their diet. I’m not usually a supporter of killing any tropical fish, but in this case it’s essential to the survival of our native species. I support lionfish removal from Florida and Gulf waters. They are invasive species, wiping out native fish. Rehoming 15,000 lionfish is not a practical or feasible solution. Rehoming all the invaders is impossible. Turning lionfish into a reasonably priced food fish could feed many many people who can't afford fish in their diet. I'm not usually a supporter of killing any tropical fish, but in this case it's essential to the survival of our native species.